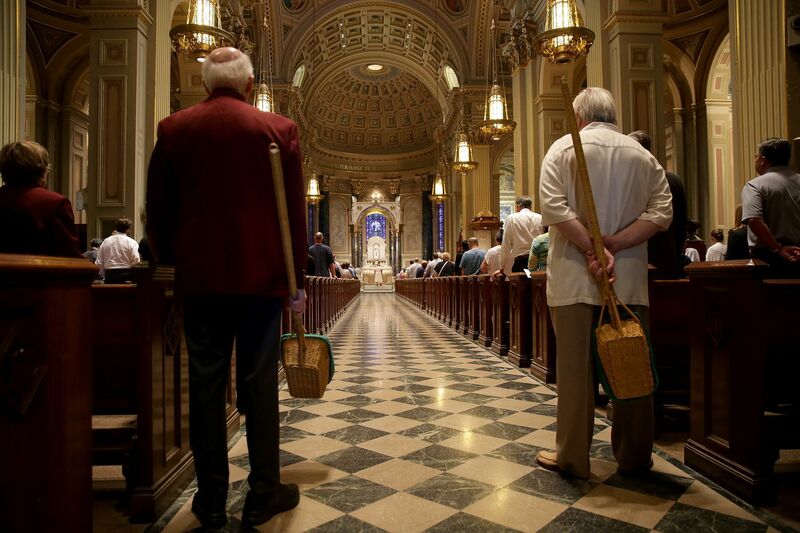 Ushers wait to collect donations during a mass for the Assumption of the Blessed Virgin Mary at Cathedral Basilica of Saints Peter and Paul in Philadelphia, PA on August 15, 2018. CHICAGO — Last week was tough. There was distressing news, including an earthquake in Indonesia and a bitter partisan divide over the Supreme Court. At home, family members were sick. I felt sad and angry, and I did not know what to do. So on Sunday, I did something I always do, which always helps. I have many problems with the Catholic Church. Many of its leaders failed miserably at protecting children. The institutional church is backward in its views about women and gays. After growing up Catholic, and taking it so seriously I considered becoming a nun, I left the church at 15. But I still had a longing for something beyond the material world. I studied Judaism and then practiced Buddhism. I finally came back to my birth church when I was 30. I figured that at least with Catholicism, I knew where most of the nonsense was. I wouldn't have to waste time being awed by the exotic, and I could concentrate on sorting out ideas about God and morality, life and death. For all the sins committed by the institution, the practice of Catholicism can offer a path to the transcendent, to what is beyond ourselves. It is a tough journey, the search for God, and it helps not to be alone. I go to Mass every week — sometimes more than once — and participate in the ancient ritual. I cantor or lector, and sing in the choir. And it helps because, apart from its anachronisms, the church gives me something I need. Every week, it invites me into a conversation about the power of love and the search for peace, and the necessity of going beyond our individual needs and looking at the needs of others. It is a call to community and sharing, in a world that tries to focus our attention on selfishness and possessions and tribalism. Sometimes I engage with the Gospel and the scriptures on an intellectual level — sometimes I just sit there, numbed by the events of the week, and appreciate both the physical and liturgical architecture. Being at a Catholic Mass is like being inside a sonnet; though what's inside changes, the structure stays the same. It's comforting to know that the same ritual, the same structure, is being repeated every day in hundreds of languages around the world. I love the mundane things about the church, too. We had a blood drive and a doughnut and coffee social last Sunday. We'll have a big ethnic festival in a few weeks when we'll celebrate the 90th anniversary of our building, and people will bring food from the Philippines, Mexico, Poland, Germany, and Ireland. A Eucharistic minister thanked the choir for singing "Happy Birthday" to his mother, who had turned 96. I laughed at the cartoon our choir director had set on the table by the piano ("This month — pumpkin spice-flavored Communion!") I got to look at babies, bouncing to the music. I got to sing with my daughter. These things, too, are church. It is these things — the reach for transcendence and the power of community — that all faiths offer. I find them in Catholicism because it's the faith I know. But Islam, Judaism, Hinduism, and other paths offer them, too. We are all reaching for something beyond ourselves, and we hope to be made better by the effort, even if our reach must always exceed our grasp. I recognize the violence that has been committed in the name of religion. But religious institutions are made by humans, and humans are flawed. Blaming a faith itself for the sins committed in its name is like blaming a hammer for bashing someone in the head. It is the misuse of a tool that can also be used for good. People have asked me how I, as a progressive and a feminist, can stay in the church with all its problems. I stay for the same reason I stay in the United States, whose leaders also have been guilty of crimes throughout the decades. It is beautiful, and it belongs to me. It is my home. Why should I let some ignorant old guys keep it for themselves? Unless I'm actually driven out, bell, book, and candle, I'll stay, and serve, and work for peace. Mary Wisniewski is a columnist for the Chicago Tribune where this piece originally appeared.